Truth is, I never quite appreciated where I grew up, so today I’d like to make amends with this wonderful place. Carpinteria, Ca is where I’ve spent most of my life; up till a short blip after high school when I moved into a dorm in Azusa, Ca. That didn’t last long and next thing I knew I was back in my old room on the Goob. After a year of living with the parents, I left the Goob to fulfill a lifelong dream of living with my bestie (and in turn, finally experiencing the convenience of a small town, since I wouldn’t be living back in the boonies anymore). By my surprise, that also didn’t last long, since I met my husband (who was living across the street from us) that same summer I moved in, and married him that very next spring. I then moved up to SLO and began a new chapter of life as a married woman. Now I get to come back to Carpinteria to visit and marvel at the wonderful place where I grew up. 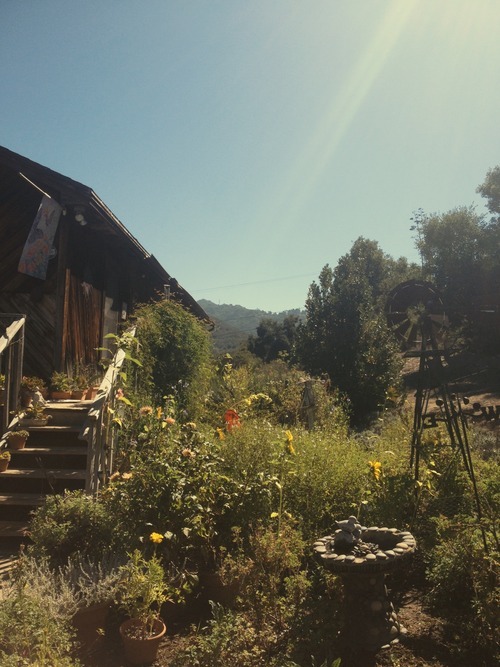 I want to spend some time giving you a look into this little town on the southern coast of California, but I feel that it’s necessary to first tell you a bit about my parents’ house back in the boonies, where I still get to call home. Yesterday, as I sat on my parents’ deck looking out at the mountains just off that backroad, I began to realize just how lucky I really was to grow up here. Our house was built by my family. It sits on one end of a 4-acre piece of land with my grandparents’ little red-roofed house on the opposite end. Smack-dab in the middle of the two houses lies the hydrangea nursery, my parents’ “first” house. Mom likes to say “Dad told me we’d have a house in a year, but I didn’t know that he meant a GREEN house.” They moved onto this piece of land in 1980 and 5 years later were finally able to move into the real house. A year later the babies began to come, Jessica in ‘86, Ellie in ‘90, and little ol’ me in ‘93 – three beautiful daughters (especially that chubby third one). The ranch was a magical place to grow up for us girls. The imagination that came of it was something only a child could think up. I have so many memories exploring the property, pretending it to be a wild jungle, a mystical far-off land, even princess Mermaid’s underwater world. The trees felt larger back then and the fields more expansive. It was a constant adventure, discovering more and more into this epic playground or a ranch. I wandered all through our property and onto the neighboring properties, even though Dad always told me not to. Every inch was explored, apart from the mysterious “haunted” shack in the small forest. It wasn’t till I was older that I realized it was just an old abandoned work shed (still pretty creepy though). Now, 21 years old, and I have a lot to learn from that imaginative little girl – she really appreciated this beautiful place. Here on the Southern California coast we don’t experience the greenest of our state but, lucky for me, our ranch happens to be surrounded by an excess of booming vegetation. Just down the road, to the right, there’s a large lemon ranch (a great source of local citrus for our kitchen growing up). Just beyond that rests groves upon groves of avocado trees (nobody minds that). On the left of us is Alan Thicke's property (yeah, that's right, the dad from Growing Pains) complete with a large fenced off green, grassy field for his horses accompanied by two long lines of the most beautiful Eucalyptus trees. Across the street from his property, there’s a couple donkeys hidden in the trees; you can usually hear them “hee-haw" in the mornings or just before sundown. Also on that side of our house is my Aunt and Uncle’s property (where I was lucky to get married under their three huge redwood trees) and two of their children’s homes just down the way (with their goats and farmland). Of course, there’s our property, to top it off, filled with the most beautiful of flowers, not to mention my mom’s exquisite and ever-growing garden. The Goob is a beautiful place, and it’s all just finally hitting me today. 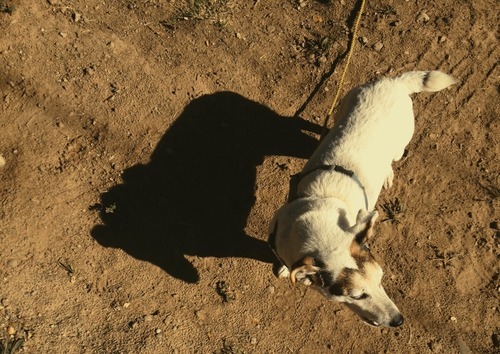 I wouldn’t be right in honoring this place without mentioning our two not-so-typical ranch dogs, one a Jack Russell Terrier, Max, and the other a chubby Chihuahua-mix, Pico. Max was rescued per my begging requests when I was 12. Pico found us, wandering onto our property a few years back and making a home under our deck. (I realized today he’s kind of like our “oops” baby, an unknown blessing that we didn’t ask for but were so happy we received.) Both dogs are interesting characters. Max has been through a lot here on the ranch, being attacked by a coyote and again by another crazed dog in the canyon and also ran over a few times. All the same, he still lives healthily to tell the tale, well, for us to tell the tale. Pico is our little lover, wanting to be pet and snuggled all the time, following my dad all over the nursery, and snorting happily as he goes along. We call him our little piggy due to the chubbiness and pig-like noises he constantly makes. They’re the boys of the family, my dad’s faithful companions. Home wouldn’t be the same without them. Now I truly understand just why people say “you are so lucky to have grown up here”. I will forever cherish this home and the beauty of it’s surroundings. Next time we’ll take it downtown.